Kevazingo – Waterfall Bubinga is an unbelievably beautiful veneer that many consider rare and precious. 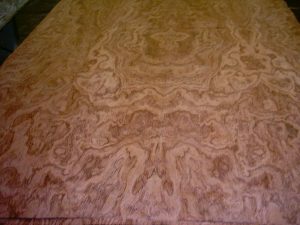 In addition, Kevazingo’s other known name, “Waterfall Bubinga,” comes from the undulating and rippling pattern that is simply striking! Truly, the beauty in the detail of this wood makes it perfect for external surfaces like furniture, musical instruments, cabinetry, stairs, and paneling. Finally, the swirls within the veneer will add an exotic and “wild” sense to any project. Because of its rare nature, this veneer is definitely one that you want to get your hands on! Pattern: Straight grained or interlocked; texture is moderately coarse.